Who needs friends when you have Friends & Family? you can share everything that happens in your life from only 9sen/minute. Then you can over share everything that happens in your life! Click on the "My Services"
Your first 10 Friends & Family are free. Every change after the first 10, there's a RM2 transaction fee. 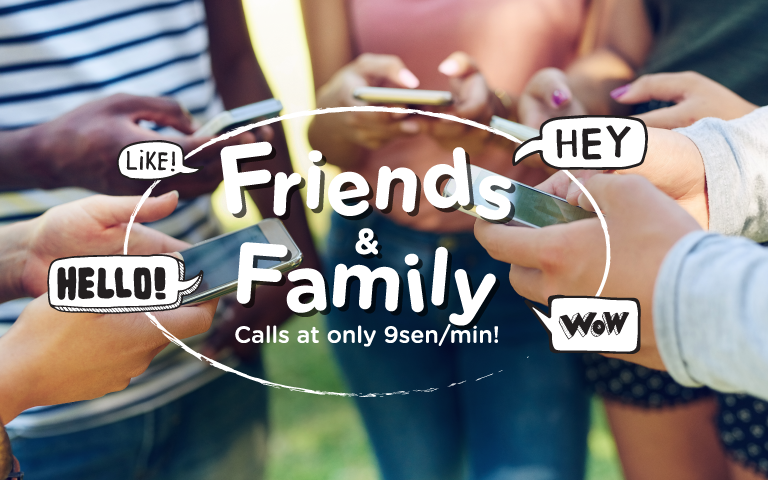 Friends & Family is Tune Talk latest’s offer where you only pay 10 sen per minute to your ten favourite Tune Talk numbers, anytime of the day. When can I start to enjoy Friends & Family? Friends & Family is available on 16 March 2012 onwards. How do I subscribe to Friends & Family? What is the call rate for Friends & Family? Only 10 sen per minute for local calls to your selected Tune Talk numbers, 24 hours a day. Are there any charges to enjoy Friends & Family? No, there is no charge or fee to enjoy Friends & Family. However, once you configured all 10 numbers, there will be a nominal fee of RM2 per transaction to make further changes. Can I add any numbers onto my Friends & Family list? No, Friends & Family is limited to Tune Talk numbers only. How do I check my list of Friends & Family number? Login to your SelfCare account or dial *111# and select “List” option from the menu.